I had a friend send me this story and I thought it would be great to share. This is a great illustration to put plainly how God works in our lives. 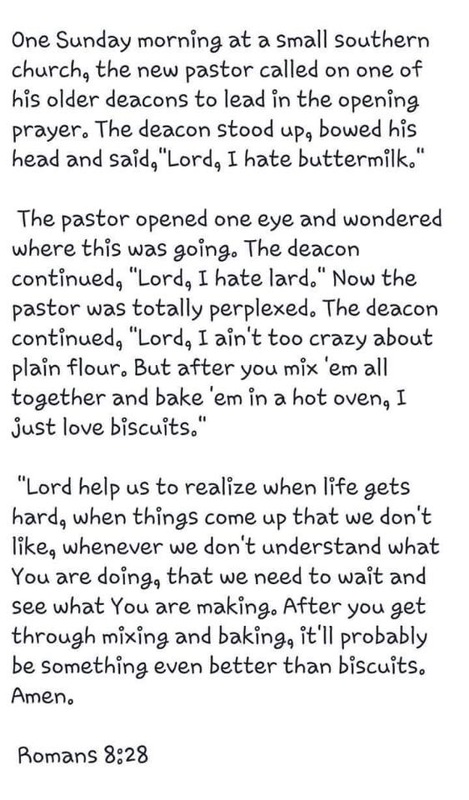 Just like the deacon wasn’t necessarily thrilled with the ingredients used in making biscuits, we aren’t necessarily excited about certain situations and circumstances that take place in our lives. Just like when you throw all the ingredients to make biscuits in a bowl it doesn’t look pretty, the circumstances or situations that happen in our lives don’t appear great either. The hope that we have is that God will take all those things in our lives and turn it into something so much better than we could even imagine. Romans 8:28 says that God takes all things that happen in our lives; the good, the bad, and the ugly; and turns them into something great. He takes our ashes and turns them into beauty. He takes our sorrow and turns it into joy. He takes our pain and turns it into a platform. Just like there is a process in making biscuits, there is a process that takes place in our lives. I’m not much of a chef or baker, so don’t judge me on my explanation of the process of making biscuits. With that said the process, in simplistic form, is you have to gather the ingredients, then you put them all together in a bowl, then you mix them, them you separate them on a baking pan, then you put them in the oven. Some parts of this process aren’t pretty and some might be even quite painful, but the end product turns out delicious. I don’t know the situation that you’re going through. I don’t know the circumstances in your life. I don’t know your story. But I do know the One who does. And I know that He has a plan and a purpose for your life. The stuff that you go through isn’t by accident. The process may not look pretty, it might even at sometimes be painful, but the end result will always turn out better than you could even imagine. Trust God that He is going to take all the ingredients in your life, the ones you like and even the ones you don’t necessarily care for, and turn them into something amazing. The secret ingredient is knowing that the Creator will create something amazing because He knows what is best and wants what is best for His creation.